Miss Jane Marple is staying at an elegant hotel from her childhood compliments of her nephew Raymond. Also there is international adventurer Bess Sedgwick and Lady Selena Hazy (Joan Greenwood in her next to last performance). A doorman working at the hotel turns out to be from Bess' past, and when he is killed, she is the prime suspect. But what does his murder have to do with the disappearance of an elderly vicar staying at the hotel, and a string of robberies over the last few months? 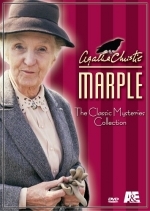 Miss Marple must find out before the murderer strikes again!! !